Yeasts are a phylogenetically diverse grouping of single-celled fungi. As members of the Kingdom Fungi, which also includes mushrooms, molds, and mildews, yeasts are eukaryotes (organisms with a distinct, membrane-bound nucleus) that digest their food externally and absorb the nutrient molecules into their cells. Yeasts do not form a specific taxonomic or phylogenetic grouping; they are a diverse assemblage of unicellular organisms that occur in two divisions of fungi (Ascomycotina and Basidiomycotina) and 100 genera. Most reproduce asexually by budding, although in a few cases by binary fission. Yeasts that reproduce via budding are known as "true yeasts" and are classified in the order Saccharomycetales (SGD 2005). 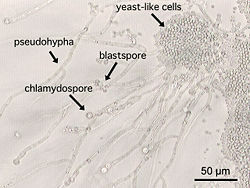 Although yeasts are unicellular, some species with yeast forms may become multicellular through the formation of a string of connected budding cells known as pseudohyphae, or true hyphae as seen in most molds (Kurtzman and Fell 2006). The term yeast is also used for commercial baking products that consist of yeast or dried yeast cells. The term yeast is often taken as a synonym for S. cerevisiae, or "baker's yeast" (Kurtzman 1994). Yeast species demonstrate an incredible diversity of forms. Although approximately 1,500 species have been described (Kurtzman and Fell 2006), it is estimated that this number represents only 1 percent of all yeast species (Kurtzman and Piskur 2006). The size of these microorganisms varies greatly depending on the species; yeast cells typically measure 3 to 7 micrometers in diameter, although some can reach over 40 µm (Walker et al. 2002). Since they derive energy from fermentation (a chemical conversion of carbohydrates to ethanol and carbon dioxide), yeasts are found primarily in sugar-rich environments, such as fruit surfaces or flower nectars. In advancing their own need for survival, maintenance, and reproduction, they also provide value for ecosystems, as decomposers, and to humans. Their ability to ferment sugars has made them an integral component of human civilization: the yeast species Saccharomyces cerevisiae, in particular, has been used in the baking of leavened bread and the production of alcoholic beverages for thousands of years. Recently, yeasts have been used to generate electricity in microbial fuel cells (HUT 2006) and to produce ethanol for the biofuel industry. Yeasts also are important as model organisms in modern cell biology research. S. cerevisiae was the first eukaryote whose genome (the complete DNA sequence of a set of chromosomes) was fully mapped. Given the extensive similarities between yeast cells and human cells, yeast homologues (or counterparts) of human genes, particularly those associated with specific diseases, may provide insights that aid in medical diagnosis and treatment. Some species of yeast, such as Candida albicans, are opportunistic pathogens that can cause infection in humans, particularly those with compromised immune systems. Yeasts are chemoorganotrophs: they use organic compounds as a source of energy and do not require light to grow. They obtain their main source of carbon from hexose (six-carbon) sugars such as glucose, or disaccharides such as sucrose and maltose. Some species can metabolize five-carbon (pentose) sugars such as fructose, as well as alcohols and organic acids. Species that require oxygen for cellular respiration are an example of obligate aerobes; others that are anaerobic but also have aerobic methods of energy production are called facultative anaerobes. Unlike bacteria, there are no known yeast species that grow only in the absence of oxygen (anaerobically). Yeasts are ubiquitous in the environment, but are most frequently isolated from sugar-rich media, such as fruits and berries (e.g., grapes, apples, or peaches) and exudates from plants (such as plant saps or cacti). Some yeasts are found in soils and in association with insects (Suh et al. 2005). Yeasts are generally grown in the laboratory on solid growth media or liquid broths. A high magnification view of a budding yeast. Budding, an asexual form of reproduction common among yeast species, entails the formation of a new organism from a protrusion on its parent cell. The most common mode of vegetative growth in yeast is asexual reproduction by budding or fission (Balasubramanian et al. 2004). In binary fission, the parent cell divides into two equal cells. Most yeasts reproduce by budding, during which a small protrusion or bud, the daughter cell, is formed on the parent cell. The nucleus of the parent cell splits into a daughter nucleus and migrates into the daughter cell. The bud continues to grow until it separates from the parent cell, forming a new cell (Yeong 2005). The bud can develop on different areas of the parent cell depending on the genus of the yeast. Although rare, some species of yeast reproduce via sexual reproductive cycles. Yeast cells can exist as either diploids (which contain two homologous sets of chromosomes) or haploids (cells containing only one set of chromosomes). The mating (or conjugation) of yeast occurs only between haploids, which can be either the a or α (alpha) mating type (thus displaying simple sexual differentiation). Under high stress conditions, such as nutrient depletion, haploid yeast cells will generally die. However, under the same conditions, diploid cells can undergo sporulation, producing a variety of haploid spores. These spores can go on to reproduce sexually, reforming the diploid cell (Neiman 2005). 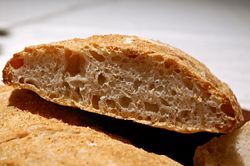 Yeasts feed on sugars, generating the end-products ethanol (essential to beer and wine production) and carbon dioxide (essential to the baking of leavened bread). Beer brewers classify yeasts as top-fermenting and bottom-fermenting. Top-fermenting yeasts are so-called because they form a foam at the top of the wort (the liquid produced from crushed malted grain and water). Top-fermenting yeasts can produce high ethanol concentrations and prefer high temperatures, yielding fruitier, sweeter, ale-type beers than bottom-fermenting yeasts, which are used to produce lager-type beers. These yeasts ferment more sugars, leaving a crisper taste, and grow well at low temperatures. 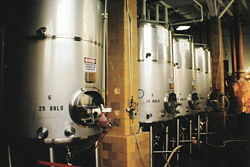 To ensure purity of strain in industrial brewing, a “clean” sample of the yeast is stored and refrigerated in a laboratory. After a certain number of fermentation cycles, a full scale propagation is produced from this laboratory sample. Typically, it is grown in about three or four stages using sterile brewing wort and oxygen. Root beer and sodas can be produced using similar methods. The carbonation process created by the active yeast is halted at an earlier stage, generating only trace amounts of alcohol and leaving a significant amount of sugar in the drink. 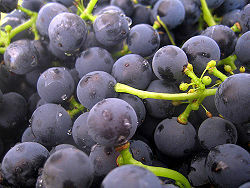 In winemaking, yeast converts the sugars present in grape juice or must ( juice of freshly pressed grapes that contains various quantities of pulp, skins, stems, and seeds). Typically, yeast is already present on the grapes, often visible as a powdery film (also known as the bloom or blush) on their exterior. The fermentation can be done with this indigenous (or wild) yeast (Ross 1997); however, this may yield unpredictable results depending on the yeast species that are present. For this reason, a pure yeast culture is generally added to the must, which rapidly predominates the fermentation as it proceeds, ensuring a reliable fermentation (Gozalez Techera et al. 2001). A distilled beverage contains ethanol that has been purified by distillation (method of separating chemical substances based on differences in their volatilities). Carbohydrate-containing plant material is fermented by yeast, producing a dilute solution of ethanol in the process. Spirits such as whiskey and rum are prepared by distilling these dilute solutions of ethanol. Components other than ethanol are collected in the condensate, including water, esters, and other alcohols that account for the flavor of the beverage. Yeast is used in baking as a leavening agent, converting the fermentable sugars present in the dough into carbon dioxide. This process causes the dough to rise as the carbon dioxide forms pockets (or bubbles). When the dough is baked, it "sets" and the pockets remain, giving the baked product a soft and spongy texture. The use of potatoes, water from potato boiling, eggs, or sugar in a bread dough accelerates the growth of yeasts. Salt and fats such as butter slow down yeast growth. The majority of yeast used in baking is of the same species (S. cerevisiae) common in alcohol fermentation. A Kombucha culture fermenting in a jar. 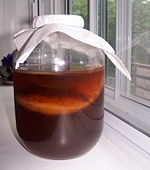 Various species of yeast are used in symbiosis with acetic acid bacteria in the preparation of Kombucha, a fermented sweetened tea. Yeast extract is the common name for various forms of processed yeast products that are used as food additives or flavorings. The general method for making yeast extract for food products such as Vegemite and Marmite on a commercial scale is to add salt to a suspension of yeast, making the solution hypertonic, which leads the cells to shrivel up. This contraction triggers autolysis, during which the yeast's digestive enzymes break down their own proteins into simpler compounds, a self-destructive process. The dying yeast cells are then heated to complete their breakdown, after which the husks (yeasts with thick cell walls) are separated. Yeast autolysates are used in Vegemite and Promite (Australia), Marmite and Bovril (the United Kingdom and Republic of Ireland), Oxo (South Africa, United Kingdom, and Republic of Ireland), and Cenovis (Switzerland). Vegemite and Marmite, products made from yeast extract. Yeast is used in nutritional supplements popular with vegans and the health conscious; in this context, it is often referred to as nutritional yeast. It is a deactivated yeast, usually of the species S. cerevisiae. Nutritional yeast is an excellent source of protein and vitamins, especially the B-complex vitamins, whose functions are related to metabolism, as well as other minerals and cofactors required for growth. It is also naturally low in fat and sodium. Nutritional yeast has a nutty, cheesy, creamy flavor that makes it popular as an ingredient in cheese substitutes; it is often used in place of parmesan cheese and as a topping for popcorn. Some probiotic supplements use the yeast Saccharomyces boulardii to maintain and restore the natural flora in the large and small gastrointestinal tract. Some yeasts can find potential application in the field of bioremediation, which can be defined as any process that uses microorganisms, fungi, green plants, or their enzymes to return an environment altered by contaminants to its original condition. The species Yarrowia lipolytica, for example, is known to degrade palm oil mill effluent (Oswal et al. 2002), TNT (an explosive material) (Jain et al. 2004), and other hydrocarbons such as alkanes, fatty acids, fats, and oils (Fickers et al. 2005). The ability of yeast to convert sugar into ethanol has been harnessed by the biotechnology industry to generate ethanol fuel. The process starts by milling a feedstock, such as sugar cane, sweetcorn, or cheap cereal grains, then adding dilute sulfuric acid, or fungal alpha amylase enzymes, to break down the starches into complex sugars. A gluco amylase is then added to degrade the complex sugars further into simple sugars. Yeasts are then added to convert the simple sugars to ethanol, which is distilled off to obtain ethanol up to 96 percent in concentration (GTL 2006). Saccharomyces yeasts have been genetically engineered to ferment xylose, one of the major fermentable sugars present in cellulosic biomasses, such as agriculture residues, paper wastes, and wood chips (Ho et al. 1998a). Such a development means that ethanol can be efficiently produced from more inexpensive feedstocks, making cellulosic ethanol fuel a more competitively priced alternative to gasoline fuels (Ho et al. 1998b). Diagram showing a yeast cell. 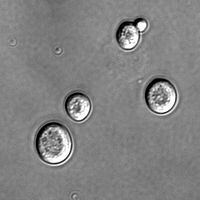 Several yeasts, particularly Saccharomyces cerevisiae, have been widely studied as model organisms in genetics and cell biology. The cell cycle in a yeast cell is very similar to the cell cycle in humans; therefore, the basic cellular mechanics of DNA replication, recombination, cell division, and metabolism are comparable (SGD 2005). Many proteins important in human biology were first discovered by studying their homologues in yeast; these proteins include cell cycle proteins, signaling proteins, and protein-processing enzymes. On April 24, 1996, S. cerevisiae was announced to be the first eukaryote to have its genome, consisting of 12 million base pairs, fully sequenced as part of the Genome project (Williams 1996). At the time, it was the most complex organism to have its full genome sequenced; the project took seven years and the involvement of over 100 laboratories to accomplish (Henahan 1996). The second yeast species to have its genome mapped was Schizosaccharomyces pombe; the sequencing was completed in 2002. S. pombe, whose genome consists of 13.8 million base pairs, was the sixth eukaryotic genome fully sequenced. A photomicrograph of Candida albicans showing hyphal outgrowth (a long, branching filamentous cell). Some parasitic fungi like C. albicans use the tip of the hypha to penetrate the host. Some species of yeast are opportunistic pathogens; that is, they can cause infection in people with compromised immune systems. Cryptococcus neoformans is a significant pathogen of immunocompromised people, causing the disease cryptococcosis, which occurs in about 7-8% of AIDS patients in the USA, and in a slightly smaller percentage (3-6 percent) in western Europe (ICMB 2006). The cells of the yeast are surrounded by a rigid polysaccharide capsule, which helps to prevent them from being recognized and engulfed by white blood cells in the human body. Yeasts of the Candida genus are another group of opportunistic pathogens, causing oral and vaginal infections in humans. Candida is commonly found as a commensal yeast in the mucus membranes of humans and other warm-blooded animals. However, sometimes these strains, which typically do not harm their host, can become pathogenic. In the figure above, the yeast cells sprout a hyphal outgrowth, which locally penetrates the mucosal membrane, causing irritation and shedding of the tissues. Candida glabrata is the second most common Candida pathogen after C. albicans, causing infections of the urogenital tract and of the bloodstream (Stoyan and Carbon 2004). 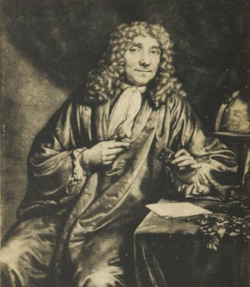 Antony van Leeuwenhoek was the first scientist to observe yeast cells under the microscope. Yeast microbes are probably one of the earliest domesticated organisms, used for alcoholic fermentation and baking throughout history. Archaeologists digging in Egyptian ruins have found early grinding stones and baking chambers for leavened bread, as well as drawings of 4,000-year-old bakeries and breweries (Phillips and Noever 2007). Yeast cells were first observed under the microscope in 1680 by the Dutch naturalist Anton van Leeuwenhoek, who at the time considered them to be globular structures rather than living organisms (Huxley 1871). In 1857, French microbiologist Louis Pasteur proved in the paper Mémoire sur la fermentation alcoolique that alcoholic fermentation was conducted by living yeasts and not by a chemical catalyst, as previously thought (Barnett 2003). Pasteur showed that by bubbling oxygen into the yeast broth, cell growth could be increased, while fermentation was inhibited—a phenomenon later called the Pasteur effect. Balasubramanian, M., E. Bi, and M. Glotzer. 2004. Comparative analysis of cytokinesis in budding yeast, fission yeast and animal cells. Curr Biol 14(18): R806-18. PMID 15380095. Barnett, J. A. 2003. Beginnings of microbiology and biochemistry: The contribution of yeast research. Microbiology 149: 557-567. Fickers, P., P. H. Benetti, Y. Wache, A. Marty, S. Mauersberger, M. S. Smit, and J. M. Nicaud. 2005. Hydrophobic substrate utilisation by the yeast Yarrowia lipolytica, and its potential applications. FEMS Yeast Res. 5(6-7): 527-543. PMID 15780653. Genomics:GTL (GTL). 2006. Fuel ethanol production. Genomics:GTL. Retrieved December 24, 2006. González Techera, A. S. Jubany, F. M. Carrau, and C. Gaggero. 2001. Differentiation of industrial wine yeast strains using microsatellite markers. Letters in Applied Microbiology 33(1): 71-75. Henahan, S. 1996. >Complete DNA sequence of Yeast. The National Health Museum, Access Excellence. Retrieved January 31, 2007. Ho, N. W. Y., Z. Chen, and A. P. Brainard. 1998a. Genetically engineered Saccharomyces yeast capable of effective cofermentation of glucose and xylose". Appl Environ Microbiol 64(5): 1852-1859. Retrieved December 24, 2006. Helsinki University of Technology. 2006. Biofuelcell. Helsinki University of Technology. Retrieved December 24, 2006. Ho, N., R. Walker, and A. Siegfried. 1998b.Yeast rises to a new occasion. American Society for Microbiology. Retrieved December 24, 2006. Huxley, T. H. 1871. Yeast. The Contemporary Review Collected Essays VIII. Retrieved January 6, 2007. Institue of Cell and Molecular Biology (ICMB). 2006. The microbial world: Yeasts and yeast-like fungi. Institute of Cell and Molecular Biology. Retrieved December 24, 2006. Jain, M. R., S. S. Zinjarde, D. D. Deobagkar, and D. N. Deobagkar. 2004. 2,4,6-trinitrotoluene transformation by a tropical marine yeast, Yarrowia lipolytica NCIM 3589. Mar Pollut Bull. 49(9-10): 783-788. PMID 15530522. Retrieved January 21, 2007. Kurtzman, C.P., and J. W. Fell. 2006. Yeast systematics and phylogeny: Implications of molecular identification methods for studies in ecology. In C. A. Rosa and G. Peter, eds., The Yeast Handbook. Germany: Springer-Verlag Berlin Herdelberg. Kurtzman, C. P., and J. Piskur. 2006. Taxonomy and phylogenetic diversity among the yeasts. In P. Sunnerhagen, and J. Piskur, eds., Comparative Genomics: Using Fungi as Models. Vol. 15. Berlin: Springer-Verlag. Retrieved June 10, 2007. Kurtzman, C. P. 1994. Molecular taxonomy of the yeasts. Yeast 10(13): 1727-1740. Neiman, A. 2005. Ascospore formation in the yeast Saccharomyces cerevisiae. Microbiol Mol Biol Rev 69(4): 565-584. PMID 16339736. Oswal, N., P. M. Sarma, S. S. Zinjarde, and A. Pant. 2002. Palm oil mill effluent treatment by a tropical marine yeast. Bioresour Technol. 85(1). Phillips, T., and D. Noever. 2007. Planets in a bottle, more about yeast. Space Science News. Retrieved January 6, 2007. Reinert, B. 2002. Schizosaccharomyces pombe: Second yeast genome sequenced. Genome News Network. Retrieved January 31, 2007. Ross, J. P. 1997. Going wild: Wild yeast in winemaking. Wines & Vines. Retrieved January 10, 2007. Saccharomyces Genome Database (SGD). 2005. What are yeasts?. Saccharomyces Genome Database. Retrieved December 24, 2006. Stoyan, T., and J. Carbon. 2004. Inner kinetochore of the pathogenic yeast Candida glabrata. Eukaryotic Cell 3(5): 1154-1163. PMID 15470243. Retrieved June 10, 2007. Suh, S., J. McHugh, D. Pollock, and M. Blackwell. 2005. The beetle gut: A hyperdiverse source of novel yeasts. Mycol Res 109(3): 261-265. Sláviková E, and R. Vadkertiová. 2003. The diversity of yeasts in the agricultural soil. J Basic Microbiol 43(5): 430-436. Walker, K., H. Skelton, and K. Smith. 2002. Cutaneous lesions showing giant yeast forms of Blastomyces dermatitidis. J Cutan Pathol.29(10): 616-618. Williams, N. 1996. Genome projects: Yeast genome sequence ferments new research. Science 272(5261): 481–480. Yeong, F. 2005. Severing all ties between mother and daughter: Cell separation in budding yeast. Mol Microbiol 55(5): 1325-1331. PMID 15720543. Yeast growth and the cell cycle. About Nutritional Yeast, Recipes Using Nutritional Yeast.